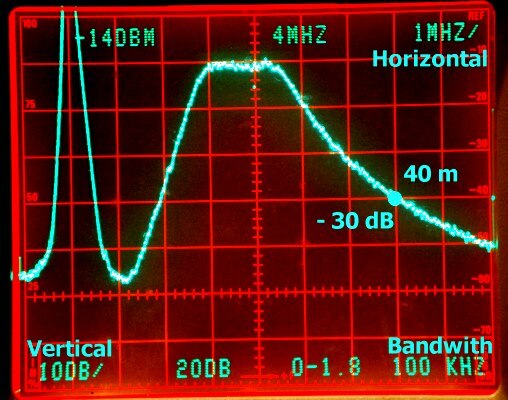 For this version of band filter, I have been inspired by an article of K4VX in QST september 1988 (click to download as PDF, about 1MB file size). These band filters are based on 3 or 5 sections Butterworth band pass filters, maintaining 50 Ohm impedance, and when built around toroidal inductors, can be made very compact. With reference to the QST article quoted, what were the objectives for the project ? 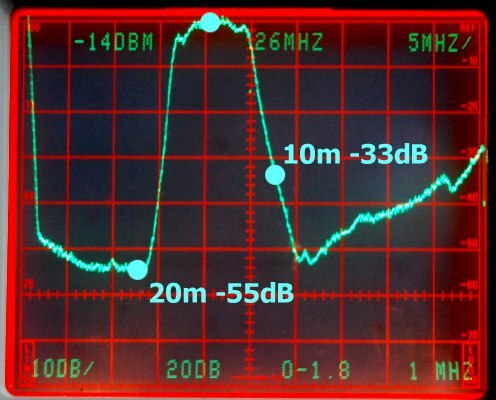 At least 25 to 30 db attenuation for adjacent band signals, and around 40dB on other band, in order to be effective. in other cases, a 5 section Butterworth filter is desirable to obtain 30 dB attenuation, a required figured to consider the filter as effective. 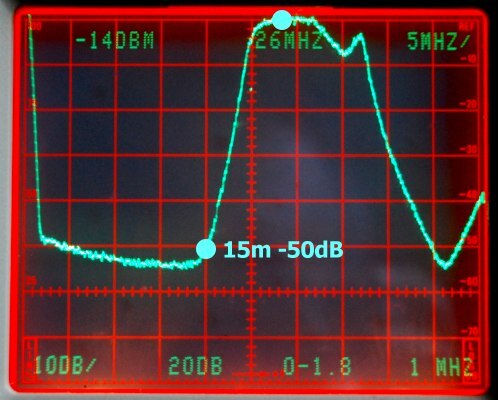 For 20, 15 and 10m bands, a 5 section filter was adopted, where the center L/C section is identical to outer sections. 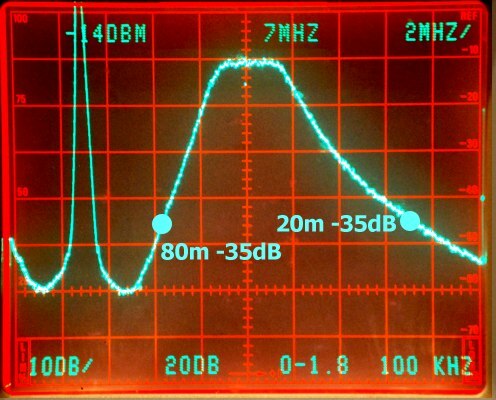 In the K4VX design, the quality factor (= ratio between center frequency and band pass width) is around 2.2. In the project, I have adopted a higher Q factor (see table). If the adequate C value is not available, please note that increasing the value of C1 C3 C5 or decreasing the value of C2 C4 will improve the Q factor. The PCB dimensions were determined in accordance with the housing. 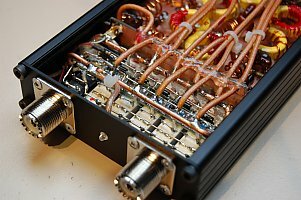 I used a nice and compact HAMMOND enclosure ref 1455L2201 (h 30 x d220 x w105 mm). Download specs as pdf 260kB here . This box has a sliding top cover , a very handy feature to adjust circuits ! The PCB board was 'etched' with a Dremel tool . As the RF-flux is concentrated inside the tores, there is no need for screening between them. Only the air wound coils must be separated as much as possible, or put at right angles one to the other. All coils to be mechanically fixed only after adjustment of BPF section, in the final enclosure ! I used for this a kind of synthetic rubber used to repair shoes, it is quite fluid out of the tube, and after drying is mechanically very strong and tough. How to adjust the BPF sections ? Adjust the filters without the relay switching circuits in a first phase. First make C1/L1 - C3/L3 resonant on the centre of the band, while L2/C2 are not yet in place. Resonance can be tweaked by adjusting the L1 and L3 coils 'spread' in the toroids. 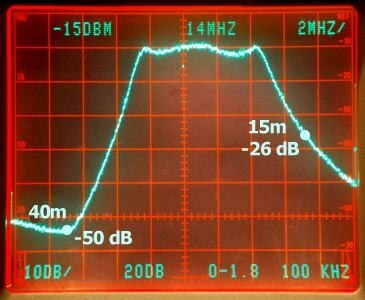 In a third stage, put the filter inline with a transceiver (QRP) and adjust for lowest SWR, tweaking L1 / L3. Check the output power, it should be about 95-90% of input. For a 5 section filter : only when the above 3 sections are adjusted, add the 2 extra section and adjust with same technique. The output power should be about 85% of input. 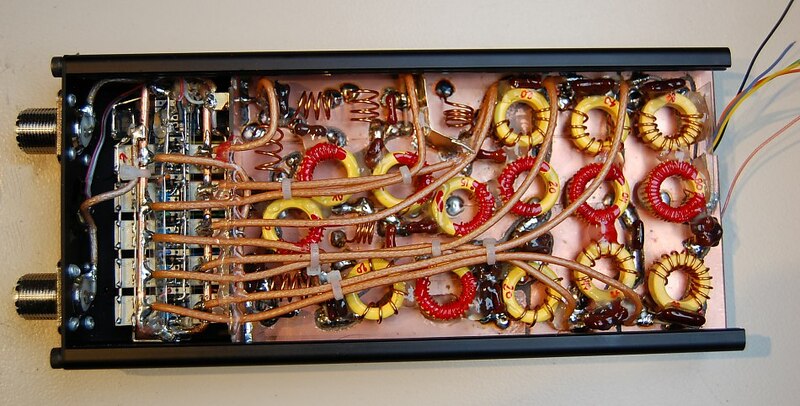 Once the filter board is in the enclosure, and the relays are connected (use small section PTFE coax 50 Ohm), the 10m and 15m needs to be checked and possibly slightly re-adjusted. 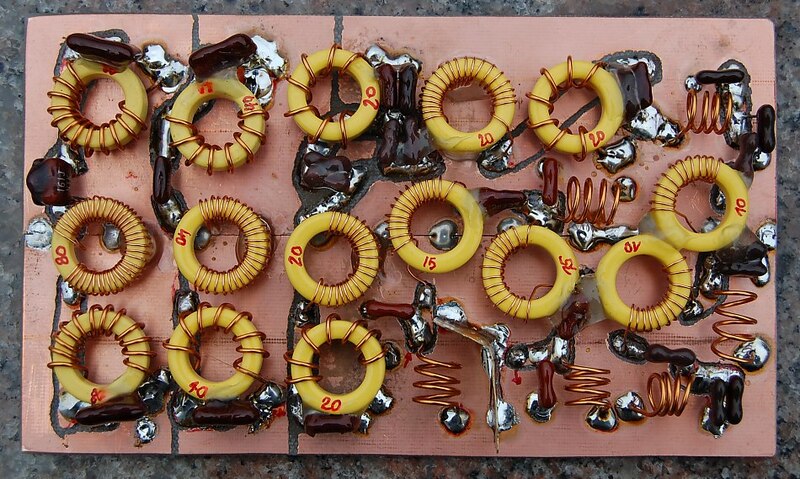 As one can see from above figures, the ultimate rejection figures are very dependent on the quality of the relay band switch. Like in some commercial products (DUNESTAR Model 600 for example), I have used DIL miniature relays, these are indeed very compact and are capable of handling 100w up to 30 Mhz (non switching). 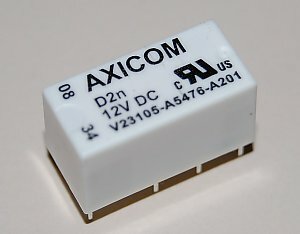 The very best DIL relay for this kind of applications are specially designed RF-Switching relays of AXICOM (click here to download specs as pdf, abt 2MB), they can handle up to 3A (whereas ordinary relays are specified as 1A max). What is the best switching configuration to avoid crosstalk between in- and output ? 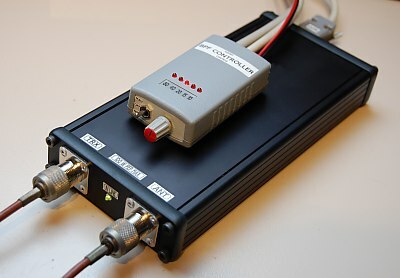 The relays are remotely controlled through a DB-9 chassis plug. I took the same pins as DUNESTAR, using positive switching logic (=their default, see model 600 brochure). The bypass relay is providing 'NC' circuits. 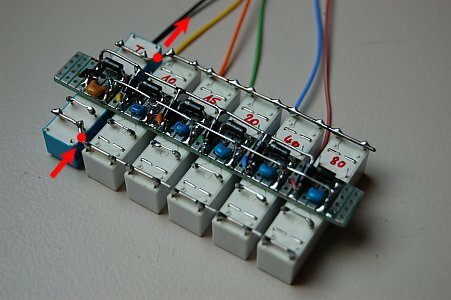 It is activated whenever another relay pair is powered (all outputs are diode-summed to the bypass relay). By N1MM logger : N1MM has the capability to output on the LPT port band data in BCD format, emulating some YAESU transceivers. This can be easily converted to 5 'control signals' by a BCD to decimal decoder (e.g. CD-4028) and a couple of transistors. Where to buy the components ? 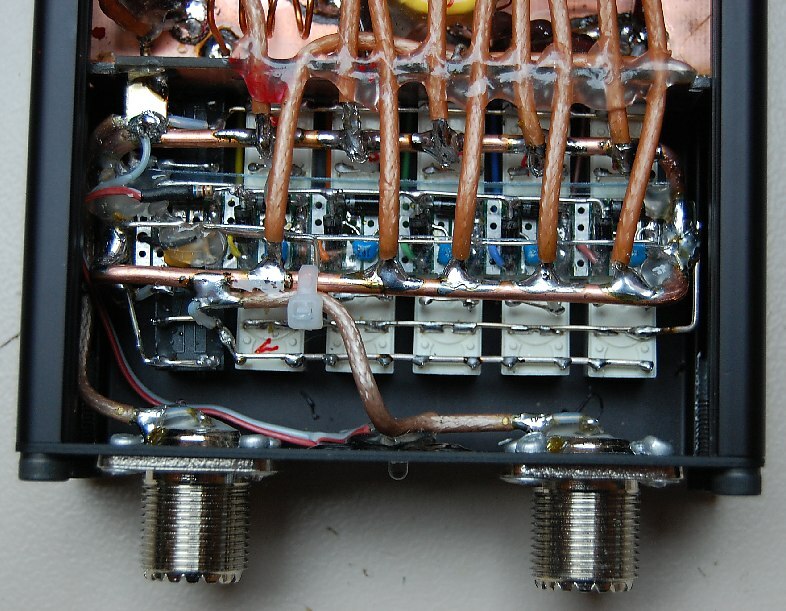 It is recommended to use SILVER MICA capacitors, and tores from AMIDON. 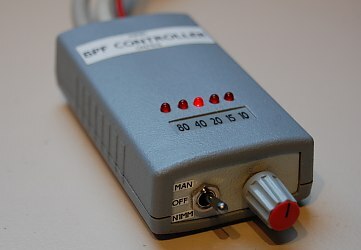 I have ordered the components to build from PROFI ELECTRONICS KUHNA in Germany (see http://www.amidon.de) , as alternative several sources on EBAY are available, where I found as well the AXICOM relays.